Ohio Wesleyan’s Oct. 4-7 production of “Cloud 9” features students (left to right) Miko Harper, Adam Lieser, Emily Shpiece and Max Haupt in multiple roles. The play is directed by OWU senior Ares Harper. The structures of family, function, and freedom are all contested in Caryl Churchill’s “Cloud 9” presented by Ohio Wesleyan University’s Department of Theatre & Dance. 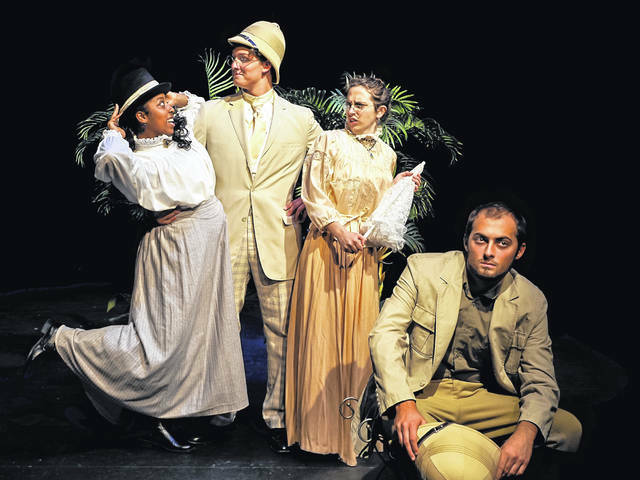 In this fast-paced farce, the audience follows a family from colonial Africa in 1880 to modern-day London in 2018, as the family searches for truth in a world that won’t stop spinning. “Cloud 9” will be performed at 8 p.m. Oct. 4, 5, and 6, and at 2 p.m. Oct. 7 on the Main Stage of Chappelear Drama Center, 45 Rowland Ave., Delaware, on the Ohio Wesleyan campus. The play, which draws parallels between colonialism and sexual repression, was written in 1979 by British playwright Churchill, known for feminist perspectives that challenge the notion of theater’s ideal spectator as white, male, upper class and heterosexual. The play’s two acts are set over 100 years apart, but the characters have only aged 25 years between the acts. Therefore, they experience some intense cultural lag and fragmentation of self. The cast consists of seven actors, ranging from freshmen to seniors, covering 18 characters: Adam Lieser, of Columbus, as Clive/Cathy/Soldier; Logan Kovach, of Westerville, as Betty/Edward; Monty Almoro, of Radnor, as Joshua/Gerry; Miko Harper, of Atlanta, Georgia, as Ellen/Mrs. Saunders/Lin; Emily Shpiece, of Rockville, Maryland, as Maud/Vic; Jasmine Lew, of Fremont, California, as Edward/Betty; and Max Haupt, of Madison, New Jersey, as Harry/Martin. Senior Ares Harper, of Columbus, directs the play. He is the first student to direct one of the university’s main theatre productions since fall 1976, when senior Bonnie Milne Gardner directed “One Flew Over the Cuckoo’s Nest.” Gardner later joined the Ohio Wesleyan faculty and taught in the theatre department for 31 years before retiring in 2016. Assisting Harper with “Cloud 9” is a production team comprised of students, faculty and alumni. Junior Josh Martin of Apex, North Carolina, is the scenic and projections designer. He is working with technical director Chadwyn Knutson, MFA, to build the actors “a playground truly for exploring the soul,” Harper said. Alumna Alanna Easley, OWU Class of 2018, is overseeing lighting design; Jackie Shelley, MFA, is creating the costumes; sophomore Noah Green, of Granville, is writing original music for the production; and junior Beverly King, of Louisville, Kentucky, is serving as the stage manager. Tickets for “Cloud 9” are $10 for general admission and $5 for senior citizens, Ohio Wesleyan employees and non-Ohio Wesleyan students. Admission is free for Ohio Wesleyan students with a valid ID. To reserve tickets, call the Theatre Box Office at 740-368-3855. For more information about Ohio Wesleyan’s Department of Theatre & Dance, including other upcoming performances, visit www.owu.edu/TheatreAndDance.